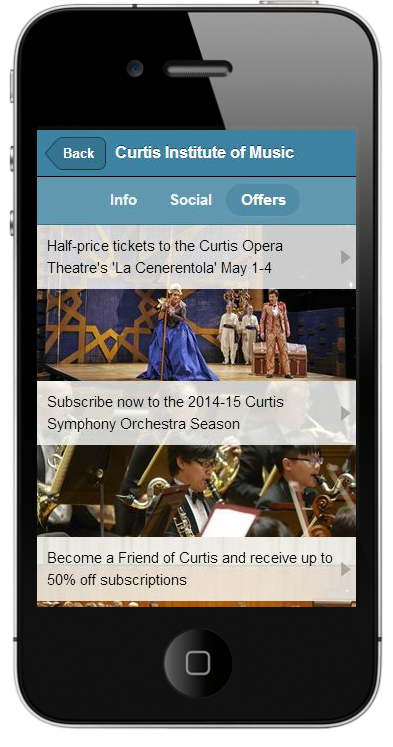 InstantEncore is excited to introduce the next stage in performing arts mobile engagement with “At The Event” – a new feature set for our mobile suite designed to deepen audience engagement and foster community among your patrons before, during, and after the show. When “At The Event” is activated for an event, a full-image landing page becomes the home screen for your Apple and Android apps on the day of the show. You control the start and end times during the day for this landing page to appear within the app. When your patrons tap on the landing page, they are taken to special content related to the event. 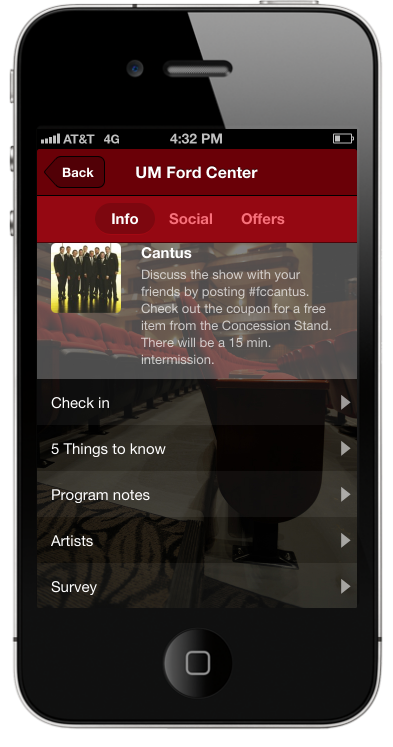 The Info screen enables you to engage your patrons more deeply with content specific to the event and the artists involved. 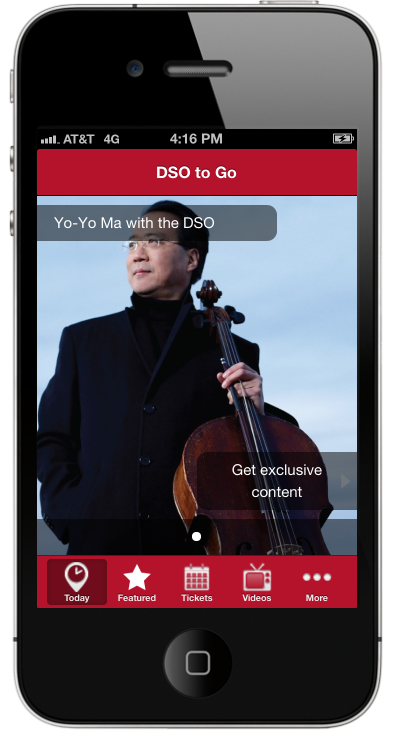 Standard features include: location-based check-in, things to know, program notes, featured artist bios, and sponsor information. You also have the ability to create custom content just for that performance, connect to multimedia content already in your app, and link out to external URLs. 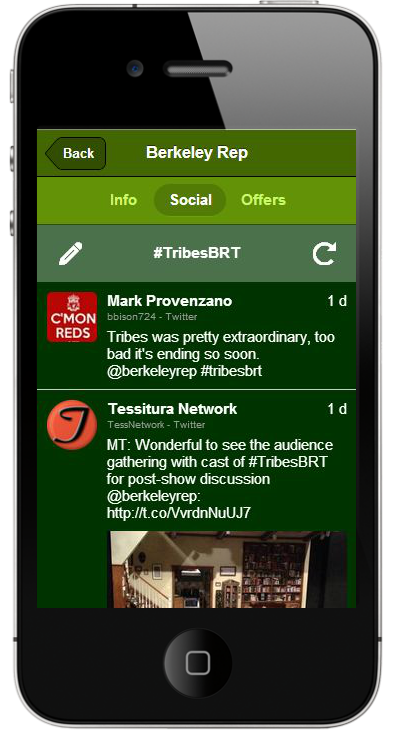 The Social screen highlights the social media hashtag for your event, aggregates posts with that hashtag from Twitter and Instagram, and allows your patrons to respond with their own posts. If a mobile user does not have an account on Twitter or Instagram, they can use the in-app posting form to engage in the conversation. The Offers screen helps you to capitalize on your audience’s attendance by promoting upcoming events, season subscriptions, concession specials, merchandise, offers from external partners, and more. Over the upcoming weeks, we will be releasing a series of posts on this blog to highlight tips and best practices for making the most of this exciting new tool for audience engagement. In the meantime, here are some resources to help you dive deeper into exploring what you could do with At The Event in your mobile app. At The Event Detailed Walkthrough (slidedeck) – This resource provides detailed specs on the various content areas within the At The Event feature set. Becoming Familiar with At The Event (video) – This video provides a visual overview of At The Event within the control panel for the InstantEncore mobile suite. Adding At The Event Content to a Performance (video) – This video demonstrates how to create At The Event content for an event. Editing At The Event Content for a Performance (video) – This video shows you how to edit pre-existing At The Event content for an event. Smart App Download URL (blog) – This blog explains how to connect your mobile users directly to the correct app for their devices. Engaging At the Event: Audience Expectations for Live Performance in the Mobile Age (PDF) – This paper charts the rise of the mobile audience and their shifting expectations for live performances. It also reveals the results for our At The Event pilot program featuring eight performing arts organizations. The paper concludes with five steps for arts organizations to meet audience expectations head on.